Roberto Martinez was on the money when he said Wigan Athletic would need to be tactically perfect against defending champions Manchester City — a soft goal halfway through the second half was the difference in this one. James Milner added a wonder strike two minutes later but probably wouldn’t have gambled on a shot from that far out without the one-nil cushion. It gave City the confidence to attack with verve against a Wigan side that had until that point looked both resilient in defence and composed in attack. The makeshift defence performed admirably. Adrian Lopez was a revelation and is clearly well-suited to a back three. The midfield pairing of James McCarthy and Dave Jones was excellent, as was Franco Di Santo, who skillfully and energetically led a number of breakaways. All in all, given the injury crisis the club is going through, this was a positive performance against a team full of match-winners. If you’d pulled four starters and several other senior players out of the squad three years ago, it would have guaranteed a hammering. Not so anymore. A missed opportunity. 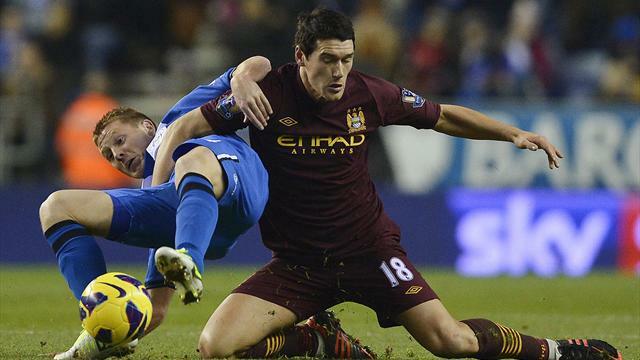 City were starting to grow frustrated and Wigan were growing in confidence. Al-Habsi’s mistake was his second in two matches. You can get away with it against Reading — just — but not Manchester City. It was effectively game over. Ali Al-Habsi: 5 — Though it pains me to say it, but his mistake led to the goal that changed the game. Emmerson Boyce: 7 — Could have done better after Ali spilled, loses a point for that. But he was otherwise excellent in his old position. Adrian Lopez: 8 — A revelation in the Gary Caldwell role. No fault in the goals, made numerous timely interceptions and tackles, and distributed well. Maynor Figueroa: 7 — One near disastrous backwards header aside, he did well alongside unfamiliar defensive partners. Jean Beausejour: 6 — Played one delicious cross in the second half but otherwise failed to have a strong impact on the game. Ronnie Stam: 6 — Rusty. Struggled to get his ball into the box. But he shows promise and could be very useful in the right wingback role in weeks to come. Especially as Boyce appears to be set for an extended run at centre-back. James McCarthy: 8 — Outstanding. Didn’t put a foot wrong all game. Broke up play and started counter-attacks. David Jones: 7.5 — His best outing for some time. Good passing, strong tackling. Jordi Gomez: 6 — Better in the first half, although casual at times. Might have had a penalty shout but stayed on his feet and then went down under lesser contact. Faded as the game went on. Franco Di Santo: 8 — Broke up play, broke with pace, created opportunities, but often found himself alone. Arouna Koné: 7 — Linked up well but couldn’t put away any of the half-chances he had. James McArthur: Glad to see him back. Callum McManaman: Came on with a minute to play for Ronnie Stam. A bit late.